Currently ran into issues with Windows 2008 R2 with Exchange 2010 using DAG (Database Availability Group) and failovers of the database happening for no reason. 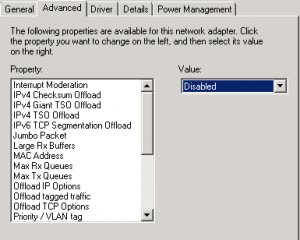 One of the suggestions is to turn off TCP Chimney Offload as well as RSS and NetDMA. Click Start, click Run, type reged32, and then click OK.
Double-click the EnableTCPA registry entry. Note If this registry entry does not exist, right-click Parameters, point to New, click DWORD Value, type EnableTCPA, and then press ENTER. 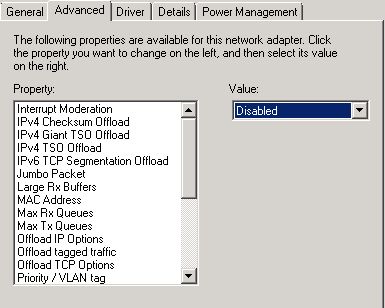 To disable NetDMA, type 0 (zero) in the Value data box, and then click OK.
You can also Open Control Panel and access it via Network and Sharing Center > Change adapter settings, right click on the adapter and select Properties and click the Configure button. Now that we are in the properties for the adapter lets make the changes. Note : Not all the options below may be present for an adapter, they will depend on the adapter type but all possibilities have been listed. If this TCP/UDP/IP Checksum Offload (IPv4) property is present, it overrides and disables the TCP Checksum Offload (IPv4), UDP Checksum Offload (IPv4), and IPv4 Checksum Offload properties. 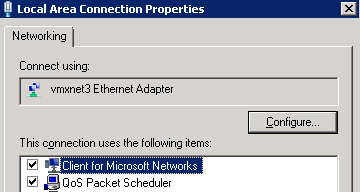 Repeat the steps for any other Network Adapters until you have completed. Reboot the server. So, did making those changes fix the problem you were experiencing? It resolved the issue I was having. It was causing th network stack to disconnect and caused failures in the cluster. Is your DAG environment virtualized ? Glad the posts are of use, I post on items that are not so easy to find.Still thinking about guest writers. I couldn’t agree with you more on finding good content. Part of my blogging philosophy is to make sure items get posted like this that is useful as good content is hard to find. Most times you only get part of the story and have to search many places to find what you need. Hi, nice article. Right to the point. I am wondering though, is there a reason why you’re using a vmxnet3 Ethernet adapter instead of the recommended e1000 adapter? Thanks Ed, I appreciate it! The reason for the vmxnet3 adapter is because this is on a VMWare 5.x farm and vmtools is installed on the servers which you get the benefits of the driver for speed, reliability and better integration with the hosts, always better to use the native driver if possible. Plus we have tested the e1000 and the vmxnet3 river on Linux and Windows systems and saw performance and reliability gains ourselves. Is there any command available that will get Properties list from Advance Tab and its value set. Performance gain at cost of cpu increased activity where offload might sometimes slowdown instead of speedup and there is the DisableTaksOffload key below the tcp/ip parameters to own desired boolean value 0 or 1,disabled, in your case 1 will speedpup probably.